Demon Kissed was surprisingly good. 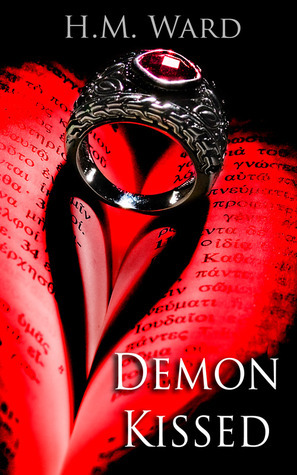 I was so anxious about the next installment that I went online to read the first chapter of Demon Kissed: Cursed which will be published on August 31, 2011. The book started with a horrifying kiss from Jake leaving Ivy half-dead. Little did she know, she was saved by Collin and later found by Eric whom she mistaken for her life saver. Ivy was originally marked as Martis, chosen by Angel to fight for their side. Collin’s save tainted her mark to change from blue to purple because he is Valefar and that turned Ivy into the girl in the prophecy. The prophecy was about a girl with a purple mark will succumb to evil and release all the evil into the world. With that save, they created a bond that allow them to communicate mentally and be able to feel each others’ feeling. It was not the typical love at first sight between Ivy and Collin. They have been friends and staying as friends because both of them have something they were afraid of. Ivy wasn’t willing to open her heart up to love someone and afraid of going through of losing someone she loved again after her sister, Apryl. Collin wasn’t willing to take the extra step because he knew what she was and an relationship with Ivy will only cause Ivy to lose her soul. The love triangle waiting to happen but never got there between Eric, Ivy and Collin. At times, I was frustrated with the story but then it twisted very quickly into another direction. The twist and turns definitely outweighs the frustrations. “I’d never betray my friends for a guy. I’d never let the world go to Hell for a guy.” I believed she did the first part in this book and will be doing the second part in the next book. The book only gave a vague background on Apryl’s death and no explanation on how Apryl knew so much about Martis because she send a lot of celestial jewelry to Ivy as protections. I think the author will explore more details there in the second book when Ivy meets Eric in Italy.